When one hears the words, “Ancient Egypt” images of pyramids, temples and powerful kings come to mind. The kings commissioned the construction of the pyramids and temples but who built them? In my class, Egyptian Voices from the Past: A Day in the Life, we will explore what the daily routines were for the general population: the construction workers, the priests who performed the religious rites in the temples, the farmers who grew the grain for the bakers and brewers, the scribes, the record-keepers of ancient Egypt and the women who raised the next generation. 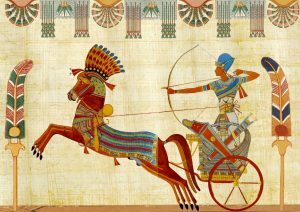 This class is for anyone who would like to see what it may have been like to live as an ancient Egyptian and see how similar their lives were to ours today. What are the 3 most important things a student will learn? The ancient Egyptians were similar to us. They worked hard for a living, fell in love and united and raised their children in a sometimes harsh and unforgiving environment. Women had legal and financial rights that were remarkably modern and sophisticated. The tomb builders staged the first recorded sit-down strike in the 12th century BCE. What inspired you to teach this class for TELOS? I have long had a passion for ancient Egypt. When I retired, it gave me an opportunity to pursue these interests. I initially began taking classes at UCLA where I learned to read and translate Egyptian hieroglyphs and do archaeology field work. This eventually lead to an MA from University College London, one of the preeminent schools for the study of Egyptian archaeology. Now, TELOS gives me an opportunity to share my passion and interest with others. They would be surprised at how similar the lives of the ancient Egyptians were to ours today. As much as one may think they know about any given subject, there is always more to learn. As new technologies are developed, additional information can be gained through its use making the interpretation and understanding of what we know even greater.